The Guadalupe River is located near Hunt Texas has some of the best fly-fishing in the state. There are two forks for this river that start at Hunt Texas. The North Fork is on the west and the South Fork is on the Southwest. The River is located midway between Austin and San Antonio and this river has some of the best trout fishing in the area. 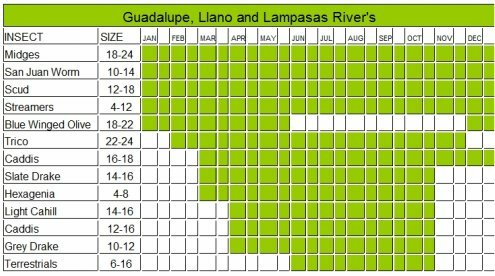 The Guadalupe River is the southern most fishery in the United States, and is often listed as one of the top streams in America to fish. There are large Rainbow Trout in this stream, something not common among other streams in Texas. At the start of the Guadalupe River on the South Fork, the Lynxhaven Lodge privately owns the first 3 miles, and you must pay $15 per day to fish this section. Most sections of this river are on private property so paying the fee and not worrying about trespassing is worth the money. In addition to not worrying about trespassing, the fishing in this stretch is really good. If it was not good fishing people wouldn't be lining up to pay to fish. In addition to the private property area there are plenty of other good fly-fishing sections along the South Fork. If you fish these other sections you will just need to be aware of the private property and be sure to respect those areas. The North Fork of the river also has a lot of private property as well. Even thought there is private property, there are still plenty of other places to access the river that have good fishing. There is good access and good fishing near RR 1340, about 10 miles from Hunt. There are some nice stretches of shallow waters and some nice deep pools in this area and the fishing is good in both directions. 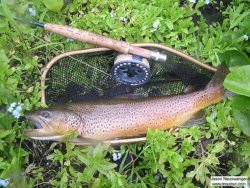 One way of how to fly fish would be to fish the banks and the pools, they seem to bring about the most success on both forks. Be sure not to play the fish too much because the warm water is already less than ideal for a fish to survive. The heat in this area makes fishing tough at times, take advantage of the cooler mornings. The fishing from September through May can be better temperature wise, but the fish counts may be off of peak. Leave the Guadalupe River page and return to Texas page.